Thanks for joining me today! I'm so excited to show you my projects in our new book Just For You. But before I get to that I want to give you a little more info on what inspired this book and what Caroline and I hope you'll do with it. This first one is my favorite, it's called the Painter's Clutch. Can you guess why? Those handles! They are made from paint stirring sticks. Yep, plain old free paint sticks with couple coats of spray paint. After I sewed up my first prototype I carried it around all year as my main purse. It's just the perfect size. I love that I can carry it like a fold over clutch and tuck it under my arm or hold onto the handles when I need a little something extra to grip. And isn't that that model daughter of mine just so cute! The inside has a single divider so your keys don't scratch your phone. And there is a nice little invisible snap to keep it closed so your stuff can't so easily escape. 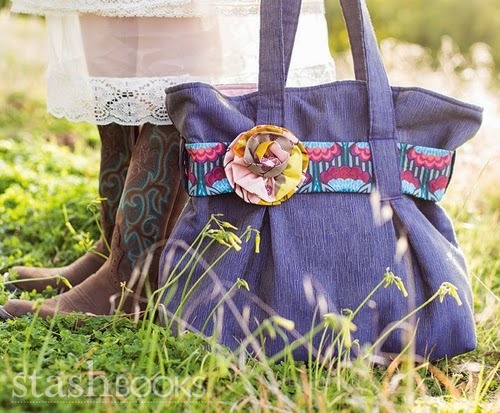 My other pattern in the book is the Venna Tote. I designed it originally for Caroline when we did our quilt market swap. My favorite thing about this one is the size. It's big and can carry all sorts of things. I think it even makes a great diaper bag. I also like the cute look of the belt cinching it up a bit. The belt loops that turn into handle make for an interesting construction technique. And the flower is a little nod to my original tote bag designs. Before I started blogging much, I used to make little tote bags to sell at local craft fairs. They always had some type of flower or bow embellishment. I'm so glad for the opportunity to finally have a couple of my designs in real pattern format. I hope you enjoy sewing them and using them as much as I have. Now for a little fun! 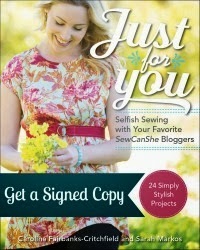 I get to give one of you lucky readers a book of your very own so you can sew something for yourself to use and love. Just enter in the rafflcopter widget below. US winners will receive a book to hold in their hands courtesy of Stash Books, International winners will receive the eBook version. And don't forget to visit all the stops on this month long celebration to see who else contributed to Just For You and their fabulous projects. The link list below will fill up as the posts and giveaways go live. I started out sewing clothes when I was 11 yrs. old. I was in 4-H and made a jumper and a blouse. I was awarded first place ribbons and went on to win a fashion show. I have since sewed all my own clothes and then my children's clothes. Now I sew for my grandchildren but mostly make quilts. Thanks for the great giveaway. I started with a pillow for my husband. I think my first ones were barbie clothes, then 4H projects. They were not the best, but they worked! My first sewing project was a carrying case for knitting needles. Just simple straight-line stitching! I started sewing in the 8th grade when the girls all took "Home Ec" I don't remember my very first project but I loved sewing and by the end of that year I had made my own 8th grade graduation dress! Your book looks like fun and it's true we always seem to be sewing for someone else, why not treat ourselves once in a while? I started in school with clothes, quilts came at a later time. I began with a doll dress for my daughter, to see what i was capable with. Then i moved on making her birthday dress. i don't have a lot of time for sewing but hopefully when my toddler is in school full time i can devote more time to sew. I have sewn everything from undies, dresses, shirts, shorts, pants, coats, pjs, and totes. I love sewing. My first project was a patchwork pillow back in Brownies or Girl Scouts. It turned out pretty well. My first shirt (in Home Ec) was awful! What an exciting book. I love the concept. And seeing your cute little purse, well, that's adorable. I was made to sew at primary school - hated it, too girly for me! I made an orange library bag, traced my footprint and embroidered it including toenails onto the bag. Fortunately I now love to sew mainly patchwork & quilting, but now I am venturing into sewing for myself. I started out making doll clothes by hand when I was about 5 years old. Then I made an apron on the sewing machine for my aunt. The first thing I made was a split skirt in an adult sewing class. That was before I discovered quilts! I started in Junior High. I needed to make a garment for Home Ec class. I chose a sleeveless tunic and short set and made it in brown corduroy. It was the 70's - what can I say? Looks like a great book. I do very little sewing for me. I started by making clothes for my dolls. Congratulations! My first project was a baby blanket for my little brother when I was twelve. The skirt I made for my daughter before she was one was what started me really sewing though. I think I started with some pajama shorts in my sewing class. That got me hooked and I made myself my prom dress and now make mostly accessories. My first thing was a throw pillow! And then (now) I've gotten more into quilts but have seen one dress for my little girl to go with her Halloween costume :) and I LOVE that big bag- I have littles so obviously I need the bag with more room! I love the cinched belt look so much! My first sewing project was in junior high and I made a yellow apron with contrasting orange thread. Not sure why those colors, but it looked good at the time. I still have that apron 40 years later! My first sewing project was a pillowcase, followed by pajama pants. I love the tote! I started with clothes my Mom used to sew so she taught me, my first project was a simple dress. My first sewing project was a tee shirt for my Mom, made in Home Ec, back in the '70's!! It fit her perfectly & she wore it to bed for years!!! I can't remember my first sewn item, I've been sewing since I was small. I learnt to sew by hand so I only made small projects. An early project I remember was a 3d frog with a ribbon for my mum to use as a bookmark. It was based on a squat cow I had, I just changed it a bit to be frog shaped! My first sewing project ever was a pillow that my mom showed me how to sew. I started sewing in Junior high school and did clothes exclusively so I could wear what I wanted! Hand sewing as a kid, I think it was clothes for my barbie dolls. I remember making a wedding dress for one of them, that I thought was awesome of course ;-). On a machine, I think my first thing was a bag for holding plastic bags in. We made it in school home ec class. My first project was a teddy bear in Home Economics (hope some of you know what that was in school). My first project was a vest for myself when I was 14. After having a baby, I got back into sewing and started then with a little Christmas dress. I'm sure it was a doll blanket for my favorite dolly and then maybe clothes for my Betsy McCall doll. That is dating me! A skirt and vest in High School, it wasn't pretty but I made it. my first sewing project was extremely crazy...a plush basketball in high school home ec class. I have been hooked since then. As I look back, curves on a first project? yikes! My very first project was a knit tank dress in 8th grade sewing class. I started sewing at around 8 years of age. I believe my first project was a little square tablecloth with lace sewn in a square in the middle. I love the totes! So versatile. I'm in my mid 50's now and at age 9, while sick at home for days, my mother sat me down at her sewing machine and encouraged me to sew 2" strips together. She crocheted rag rugs w/the 2'Strips. By day two she had me making my first A line dress, blue back ground w/red/green/yellow flowers. It even had a zipper in the back. I've not stopped sewing since. About 5 years ago I began quilting. I now make quilted gifts and occasionally still sew clothing for me such as dresses, tops and totes/bags, kitchen aides. 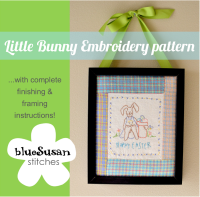 I began sewing when my first child was born (as I'm sure many do!) with simple things like pants and hats, then slowly taught myself kinds of tips and techniques. I even made her first christmas dress, all satin and velvet and it was stunning if I do say so :) Would love to have some fresh ideas for a little me-gift! Thanks for the opportunity! I love quilting,and make odds and ends like purses and bags. It is nice to meet all you wonderful women, and see what other sewers are doing. Such a scence of friends and community. I hope to win a copy of this book, but may have to buy it just for the painters cluch! Nice to join your list of followers. A little baby doll. Made with a friend.we each made one. Little baby doll. Made with a friend. We both made one. When I was in primary school at 4 or 5 yrs old all the girls made a needle case - it was popular to do embroidery then as young girls and the case was a rectangle of about 10" gingham one side solid the other. Before making the pouch like case we had to sew cross stitches in 4 rows on the gingham where the front flap would be to decorate it. Then the two rectangles were handsewn around the edge with a gap to turn it inside out. Then the bottom thrid was folded up over the middle third and whip stitched along the sides. Leaving the top third to fold down and close with a press stud (popper or snap which ever you know it as) on each side. We also stitched a small rectangle of flannelette inside the top flap to put sewing needles on, and the embroidery floss went inside the pouch. I still have this needlecase 60 years later, one of the press studs is a bit lose now, and we had a huge housefire once and it got a bit discoloured with smoke damage but still useable. I remember making it so well. We had strict teachers in those days and I learned all of my sewing skills from ladies who insisted the work was done correctly. I love the painters bag you made and the fabric is stunning - I left a comment about my first sewing experience but it is not showing yet so I hope it shows up sometime. Awesome bags! Thanks - I love bags and totes - can't wait to make one for myself! Love your bags - hope I win - I'd love to make both of them! My first project was an A-line skirt. I made it in the 7th grade. I started with clothes back when they used to teach Home Ec in school. I remember making an awful double-knit skirt! I guess it was in style at the time. I started sewing shorts for myself when I was 7. In HS I made all my clothes. I switched to quilting when our first son was born, but still made a lot of clothes too. I love bag making! My first sewing project was a dress that my grandmother helped me cut out and sew when I was about 10.
my first sewing project was in home ed and we made a baby's crossover top and bloomer pants to match - I still have them !! My grandma started me on a pencil case. it wasn't long before i was getting her to show me how to make clothes though! 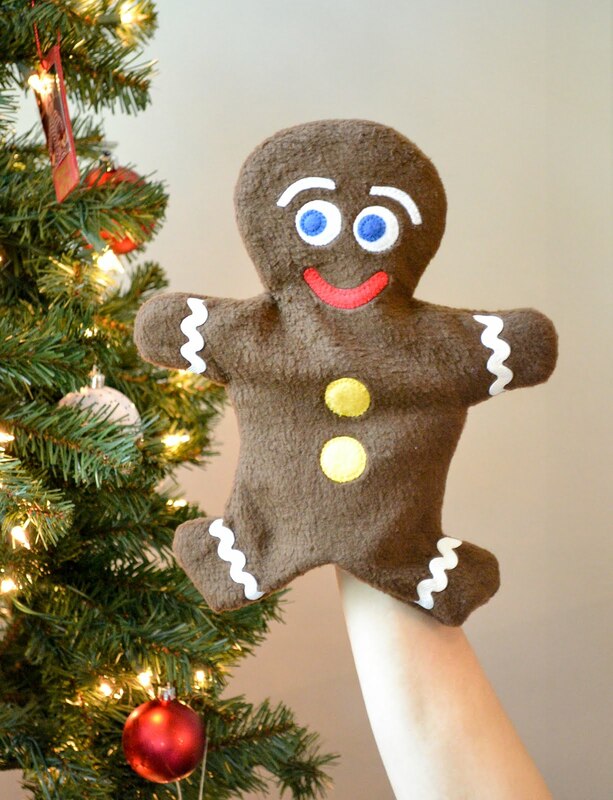 My very first sewing project was a hand-sewn puppet that I made in Brownie Scouts. My first machine-sewn project was an apron in 7th grade sewing class. I love both of these bags and your daughter is cute, my first sewing was an upcycled project since I didn't have real fabric, I took a pair of old pants of mine and a onesie top of my daughter's cut off the bottom of her onesie and added my pants to make a dress, she still has it and loves it and it's been almost 3 years, who knew a 6 mo. old onesie could last so long!